Early on the Fourth of July, the US government announced it was taking over the main website of the BP oil disaster response, deepwaterhorizonresponse.com. From early on in the disaster, that site has served as a joint venture of BP and various government agencies to post press releases, media advisories, photos, video, and other PR materials about the oil, including a mailing list for media and other interested parties. Now, the Department of Homeland Security wants to make a “one-stop shop” for the disaster response under a .gov URL. That means shutting down the current site, and taking another look at who has access to post on the site, with government deciding control of the content and message. So why did DHS allow BP to walk off with the mailing list of everyone who signed up for information about the disaster? I’ve received emails from the site every day since it went live 10 days after the disaster. Every email has come from some variation of “Joint Information,” or “Deepwater Horizon Response.” Yet today, less than 24 hours after DHS announced it planned to take over the response website, I get my very first email from “BP America Press Relations,” titled “BP update on Gulf of Mexico spill.” The email from BP was sent to the same address with which I signed up on the original response website. In recent weeks, the Obama administration has sought to distance itself from BP in handling the Gulf of Mexico oil spill — with one notable exception: When it comes to assessing how badly the spill has harmed the gulf, the two sides are working hand in hand. Their shared goal? 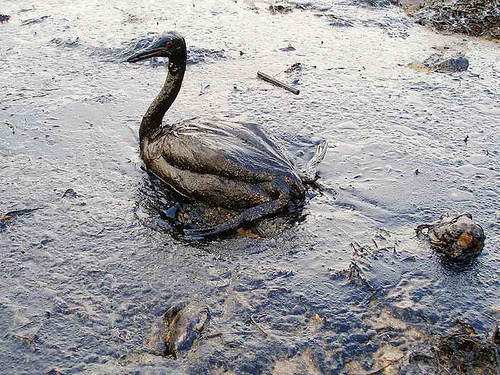 To calculate the incalculable: how much it will cost to restore the gulf to its pre-spill state. But this close collaboration between federal and state authorities and BP — which is routine procedure under a legal process known as the Natural Resource Damage Assessment (NRDA) — has begun to spark concerns among lawmakers and some environmentalists. “I want this to be independent, for the credibility of the information,” said Sen. Ben Cardin (D-Md. ), who as chair of the Environment and Public Works Subcommittee on Water and Wildlife will hold hearings this month on the issue. Although BP generates a huge amount of cash with oil prices at their present levels, the market is still concerned about its financial strength in the face of rising liabilities. So it is only natural that BP is looking at a range of options for improving its liquidity. Its problem is that very few sources of finance are open to it at the moment. Since the failure of its attempt to use a “top kill” – pumping drilling fluid down the well so it can be cemented over – at the end of May, the markets have become alarmed about BP’s financial position. The shares have hit 14-year lows, its bonds have also fallen sharply, and the price of its credit default swaps – the cost of insuring the company’s debt against default – have soared. Its debt has been downgraded by all the major rating agencies, pushing up the cost of its borrowing. The UK oil producer is not in a position to make a significant difference to its financial position until its second-quarter results on July 27 at the earliest, when it will give some idea of the total bill it is facing. More crucial to investor confidence is the success of BP’s latest plan to stop the leak – a relief well, which is scheduled for completion in August. In the near-term, the company is not facing a liquidity crisis. The agreement it reached with the White House in mid-June, which gave it three-and-a-half years to pay into a $20bn (£13.2bn) fund to compensate victims of the spill, has bought BP precious time. By suspending the dividend for the rest of the year and cutting capital spending, it is freeing about $10bn of cash, and plans another $10bn of disposals during the next 12 months. However, a rapid escalation of liabilities, or a squeeze on cash flows caused by a fall in the oil price, could still force it to raise new funds. According to Rosenfield, the officers said they had a right to look at photos taken near secured areas of the refinery, even if they were shot from public property. Rosenfield said he was told he would be “taken in” if he declined to comply.